As the largest portion of the brain, the cerebrum weighs about 2 pounds in a normal adult. The cerebrum is around most of the structures of the brain and contains billions of neurons that control everything that a person does, thinks, and senses. As the most well-developed part of the brain, the cerebrum is what most people think of when they think of the brain. The cerebrum controls language, senses, thinking and personality so damage to the cerebrum can have very distinct outcomes depending on the part of the cerebrum that is damaged. 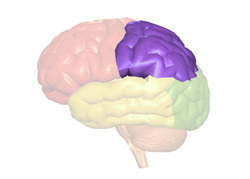 Cerebrum can be divided into 4 lobes, what are the functions for each lobe? And also, what are the functions for other major parts of the brain? The cerebrum is the largest part of the brain and consists of four different lobes that control senses, thoughts, and movement. The cerebrum is divided into two halves that are linked by the corpus callosum. The corpus callosum passes messages between the two halves of the brain. The right half of the cerebrum controls the left side of the body; the left cerebrum controls the right side of the body. 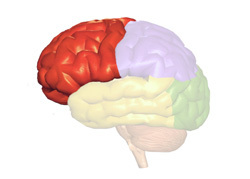 The four lobes of the cerebrum are the frontal, parietal, temporal and occipital lobes. The frontal lobe, as the name implies, is located in the area of the brain around your forehead. Emotions, planning, creativity, judgment, movement and problem solving are controlled in the frontal lobe. 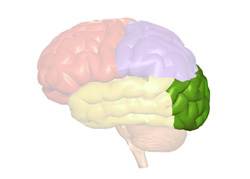 The frontal lobes are further divided into the prefrontal cortex, the premotor area, and the motor area. The parietal lobe is behind the frontal lobe and on the top back of the brain. The senses of temperature, taste, pressure, touch and pain are controlled in the parietal lobes. Some language functions may also be controlled in the parietal lobe. As the name implies, the temporal lobe is located on each side of the brain behind the temples. 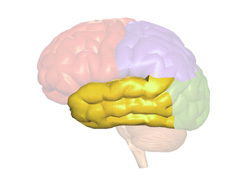 Most hearing and language functions are controlled in the temporal lobes. Emotion, learning and auditory processes are also located in the temporal lobes. The occipital lobe is located at the back lower part of the brain at the back of head. Vision and the ability to recognize objects are controlled in the occipital lobe. The retina of the eye sends input to the occipital lobe of the brain which then interprets the signals as images. There are two layers of the cerebrum. The thick outer layer is called the cerebral cortex. When you hear someone talk about “gray matter”, they are typically talking about the cerebral cortex. This layer is involved with thinking, the coordination of movement and your personality. The second layer of the cerebrum is the white matter of the brain. This network of fibers runs between the different parts of the brain and allows the different areas of the brain to communicate and pass messages. In addition to cerebrum functions, there are also two other parts of the brain that are lower in the cranium. These two parts are the cerebellum and the brain stem. 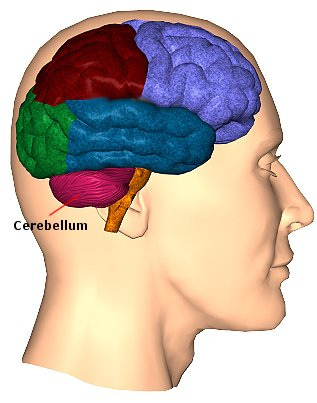 The cerebellum is on the lower part of the brain toward the back of the head. Although it is small compared to the rest of the brain (accounting for only 10% of brain weight), it has more neurons than the rest of the brain. The cerebellum is responsible for balance and movement. Your posture, reflexes, sequence learning, timing and motor learning are controlled by the cerebellum. The brain stem is composed of the pons, midbrain and medulla oblongata. It plays a very important role in homeostasis. It coordinates with motor cortex as well as associated areas to control movements of face and limbs. The brain stem controls breathing, heart rate, temperature and blood pressure. It helps to control sleep and relative alertness. Because of its control of vital functions, injury to the brain stem can result in death.